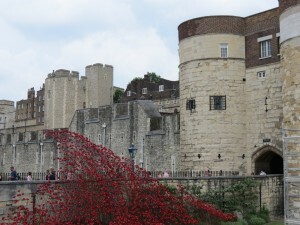 Poppy Arch, Tower of London. Photo by author. A kangaroo burger beckoned from the menu. It was a small taste of the exotic in London’s Mile End area, which is known primarily today as the site of Queen Mary, University of London’s main campus. After the third of four long days discussing “Perspectives on the ‘Great’ War,” an exotic burger seemed like a nice reward. Blood and iron? The Great War in meal form. I ordered it. After 150 presentations over four days of conferencing, one theme persistently emerged: the Great War was a global matter, transcending the arbitrariness of national boundaries. In one of many keynote addresses, Jay Winter, arguably the most influential living historian of the First World War, implored attendees to move beyond the national and even the international. Embracing the steady din of “transnationalism” in today’s academic milieu, Winter was emphatic that our job as scholars was now to locate and trace the threads that cross borders of all kinds, speaking to a greater, shared human calamity. Christopher Clark, whose recent(re)appraisal of the war’s outbreak has been widely celebrated, provided additional insights into these matters by further complicating the very notion of political and geographical boundaries. The world leaders’ cynical and naïve attempts at a localized war in 1914 were disastrously flawed given the increasingly intertwined global populace and its myriad of social, political and economic concerns. In most cases, he claims, these leaders sleepwalked through a ruinous series of escalations during Europe’s long and hot July, 1914, thus sharing in their complicity in ways that would mirror what Winter had said of shared tragedy in its aftermath. This war appeared quite capable of being fought with little disruption to European life, never mind its global implications. In fact, the 1914 Tour de France began the same day as Archduke Ferdinand’s assassination and ended mere days before the outbreak of a pan-European war that quickly went global. As the cyclists did the tour of the German and Belgian borders as part of its route, neither the athletes nor the gathered crowds could detect the implications of the rising tides of militaristic nationalism—neither at home nor abroad. As Charles Emmerson notes in his excellent 1913: The World before the Great War, the world stood on the cusp of globalization in commerce and politics, especially, lending credibility to a generally optimistic social demeanour for those who would become the antagonists in 1914. The straining and cracking at the edges of this, the economic competition and subtle political differentiations, which were equally the result of this increased intersection of cultures, could thus be double-edged. Militarism and nationalism had not, in fact, gone away: instead they were mirrored and amplified across a continent and, by implication, the world. The result was global catastrophe. As the final day of the conference drew to a close, and quite unlike the events of a century prior, the tone was clearly one of rapprochement. Not only of scholars and their findings, but of their communities still wrestling with the implications and spectres of global war. Austrians and Italians, Turks and Greeks, Germans and French—scholars from these formerly warring nations had spent four long days exploring their mutual past in a spirit of broad complicity, frequent introspection and self-criticism. Such self-reflexivity seemed appropriate for a conference during which Paul Fussell’s 1975 classic (though thoroughly critiqued) The Great War and Modern Memory was cited. Fussell framed the First World War as a paradigmatic “modern moment,” with absurdity and irony forming the literary heart of his study. These mostly European scholars, however, extended Fussell’s soldierly self-reflexivity to the very study of the war, itself. Today, it was frequently implied, the irony and absurdity of studying war underpin the transnational moment, as the necessarily global implications of warfare come into sharp focus and the categories of nationalistic study fall away in their wake. Such ideas required further thought and discussion. A nice beer would help. A colleague located a nearby Belgian pub, and we planned our invasion. 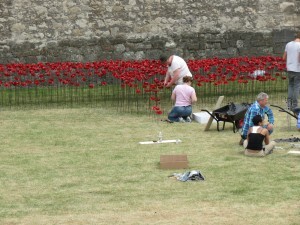 Poppy installation. Photo by author. Paul, the proprietor, brought tea lights as a substitute for lit bulbs overhead and asked our table if we knew why he was turning out the lights. When he learned he was dealing with a table’s worth of expertise on the subject, he sat with us for a good long while, explaining what that war a century ago meant to him today. “It gave us a right to remember, or not,” he said, meaning that the war for so many Britons now symbolized a broader push back against oppressive regimes and European despotism. Here we sat by candlelight, by choice, while news of the Israeli bombing of a Palestinian power plant had reached us only days earlier, plunging Gaza City into darkness that has its origins in that first of the World Wars. Someone else mentioned ISIS—the Islamic State in Iraq and Syria—who have as one of their stated aims, as Paul reminded us, the obliteration of the hated Sykes-Picot Agreement of 1916 and its arbitrary carving up of the Middle-East. Kyiv versus the Kremlin, for its part, has its recent history of national and ideological warfare evoking the First World War, with its push-and-pull relationship between East and West today echoing Ukraine’s divided loyalties a century ago. And, as one expects in international conflict, one cannot help but hear the echoes of ’14-’18 and its flag-waving nationalisms. My thoughts turned to home and to a nation whose leaders were still mired in this type of narrowly defined nationalism. I recalled then Paul Nash’s moment observing “ridiculous, mad incongruity” only not at the sight of flowers sprouting from the trenches, but rather of the uncritical persistence of a particularly Canadian national remembrance, in all its vainglory and martial navel-gazing, versus an increasingly global consensus that is very different and very troubled in its tenor. While we settled up with our server and thanked Paul for his hospitality, I downed the last mouthful of my Duchesse de Bourgogne, a sour red beer from West Flanders. Given the long years spent in the region by the people of many nations a century ago, it suited the occasion well. That final taste left a lingering sour-sweetness on the tongue, but its earthiness also brought back the blood and iron of the previous night’s kangaroo meal. I was reminded once more that some things linger, and just when they seem to be languishing they can be summoned into existence again. The First World War lingers still, greater than conceived and greater still than often imagined, with a blood and iron legacy more sour than sweet. Christopher Schultz is a PhD Candidate at Western University, and in addition to writing about the social and cultural construction of “home” on the Western Front of WWI for his dissertation, he has also been a film reviewer, and the author of pedagogical materials for both high school and university educators. He is currently serving as co-editor of the Canada’s First World War series on ActiveHistory.ca, and this is his first contribution to the site. ActiveHistory.ca is featuring this post as part of “Canada’s First World War: A Centennial Series on ActiveHistory.ca”, a multi-year series of regular posts about the history and centennial of the First World War.